There is nothing better than driving a Lotus Elise, on a sunny morning on a deserted, twisty road, you will approach motoring nirvana. Lotus has cleverly matched the punchier engine with a close-ratio gearbox as standard. 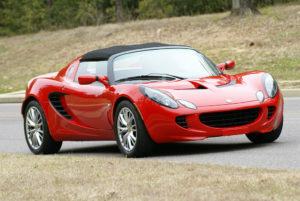 Lotus Elise comes standard with air-conditioning, antilock brakes and a CD audio system. But don’t look for stability control or power steering on this sports car. The Lotus Elise adheres to company founder Colin Chapman’s four basic automotive design philosophies: It is lightweight for better performance; it is fun to drive; it provides a comfortable ride and exceptional handling; it is innovative. The Elise first went on sale in Europe in 1996 becoming the best-selling car in company history and creating waiting lists of up to one year to buy what the European motoring press has labeled the best handling car in the world. 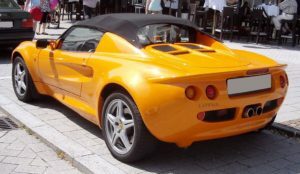 Lotus Elise weighs just 860 kg (1896 lb). That is a very light car and Toyota’s 1.8-liter engine takes it 0-60 under 5 seconds. Weight is a big part of what makes this car work so well. The Lotus-designed lightweight chassis is constructed of epoxy-bonded aluminum and steel rear subframe wrapped in a composite fiberglass body. Lotus Elise This super lightweight roadster has the handling characteristics of a go-kart. The Elise comes equipped with a 1.8-litre four-cylinder that pushes 189 horsepower at 7,800 rpm and 133 pound-feet of torque at 6,800 rpm. The Lotus Elise has combined CO2 emissions of 177g/km and combined fuel consumption of 38.5mpg and it really is all the car you will ever need. The Elise range already consists of the entry-level S, which is a sweetly balanced car that you could live with every day, and the more sporting Elise R, with its screaming engine. The SC sits between these two cars in character, though in reality it has a bit of both in its make-up. Following the demise of Rover and the subsequent loss of the K-series powerplant the Elise range has lacked an entry level model with the 111R and Sports Racer carrying on with the VVTL-i Toyota engine. The Lotus Elise is a big leap forward for a car that has already been voted sports car of the year 3 years running. Sitting snug and low in the perfect driving position, you’ll feel the excitement build even before you start the engine. As long as you drive with the hummingbird responses that formula cars and Lotus Elises demand when close to the limit, the car will tell you exactly what it’s doing. In normal circumstances, a mildly brisk cruise down the coast there’s enough grip in reserve that cornering becomes a simple swing of the wheel, and the limit is so high you need only pay attention to the scenery. When the definitive automotive history of the 20th Century is written, the Lotus Elise will be worthy of a lengthy footnote. Although the original Series I car was the version that broke new ground, the Series II is a more accomplished proposition. The Lotus Elise requires some care while accessing the cabin. It requires quite a climb but is made easier with the top down. The Lotus Elises unique bonded structure endows it with chassis stiffness that makes the whole package such a fun car. It is it’s responsiveness to inputs and the way the car fits you like a glove that makes it so rewarding. The Lotus Elise is an extreme wake-up call to all sports car manufacturers; a large engine isn’t always essential. The Lotus Elise is one of the best drivers cars around for both track use and on-road thrills.